People service their cars and other mechanical items for two main reasons. Firstly, to increase their lifespan, and secondly, to increase their own personal safety. Both of these benefits apply here as well. We are big supporters of regular check-ups because of the huge benefits these inspections provide. By regularly giving your system a once-over at least once or twice a year, you will find that many common problems will be nipped in the bud and won't manifest, potentially saving you a great deal of money later on. When something breaks, other parts of your door suffer as well, so the timely replacement of one component actually benefits the performance and longevity of additional parts. More often than not, if your door starts acting up and shows some irregularities, its opener system or its springs can be at fault. Both of these components will be well addressed. Our technicians will examine their condition closely and immediately replace any part that isn't up to par. 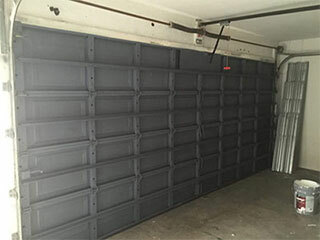 Broken springs and worn out motor gears will become a distant memory if you have our team regularly service your garage door. The main work we perform during a maintenance appointment revolves around the different hardware parts. The springs, in particular, will receive a great deal of attention. We will lubricate them to keep their performance smooth and efficient and make sure their tension distribution is completely balanced. If this is not done, then these components will overstrain, which will cause them to break down prematurely. A lot of other parts of your system will receive a similar treatment. If you have steel rollers we will lubricate them too, as well as any bearings and hinges that can benefit from it. We'll also test the condition of your lift and safety cables, and check to make sure they aren't getting frayed. If we find that they are, we'll replace them right away. Your tracks will also be inspected, and any bending or misalignment we find will be addressed on the spot. Another key aspect of our maintenance service is the photo-electric eyes that your opener uses to prevent it from closing the door on while something is blocking its path. We will check the condition of these sensors, as well as their alignment. If we find that they are incapable of properly detecting an obstacle, we'll realign their position and make sure that your door is safe to use. This routine service will help your door and all of its components to continue functioning for a very long time. Contact our team at Garage Door Repair Conroe to schedule an appointment today.